The sound of Lake Michigan waves crashing on the shore a stone’s throw away from the apartment. 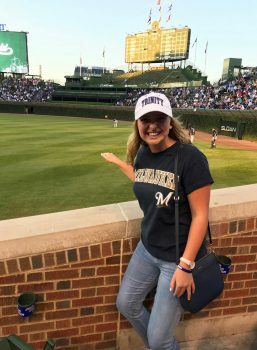 The song “Go Cubs Go” being sung at Wrigley Field and the friendly banter that follows (because GO BREWERS). Laughter from participants at North Side Housing and Supportive Services who discover that there are enough baked beans in the food pantry to feed a small crowd. Praises rising from the community of believers at City Church, all worshiping our Lord. Discussions around the art events that Chicago Semester students have attended, provoking conversation about the relationships of characters in the last play seen. The sound of sirens echoing off of the high-rises, another fire engine blaring their horn. Cries of participants at North Side Housing who have lost hope in finding housing, believing there is no one left to help. Despair heard in the voices of the homeless individuals sitting on street corners asking for meager coins in order to eat that day. The silence on the CTA reverberating through the morning commutes. The sounds of the city bring both extensive joy and a sadness that digs deep. My name is Allison Gartman, and I am from Oostburg, Wisconsin. 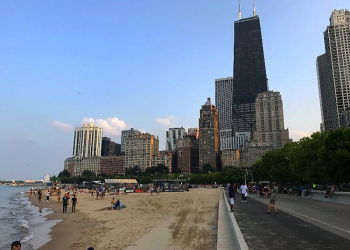 As a social work student at Trinity Christian College, I looked forward to the opportunity to learn in the city of Chicago for the past years, and have grown immensely through this experience already. I am interning at North Side Housing and Supportive Services in Uptown, this organization providing connections around the city to housing, food pantries, physical and mental health support, and clothing, acknowledging the need for a holistic, healthy life. Through the few weeks that I have been an intern, I appreciate the knowledge gained in connections throughout the city, the start of an understanding in how to engage with participants that differ from me in beliefs and practices, and the support that my supervisors and staff at NHSS have given. The sounds that I discussed above are just a few of the everyday experiences that come with living in the city of Chicago. I am becoming accustomed to the amounts of people walking diverse paths in life, and they make up this bustling city. These opportunities are new, God using these all to form me and other individuals residing in Chicago. Pastor Kent of City Church discussed in his sermon this past week how God is continually doing something new in our lives. He shared from Isaiah 43:16-21, these verses saying “see, I am doing a new thing”, and we as people are custom made to praise Him through it all. The song New Wine by Hillsong sings, “make me a vessel, make me an offering, make me whatever you want me to be.” Through the sounds and experiences had this semester, I will be praying for God to be doing a new thing not only in me, but also the city of Chicago. Although I do not think I ever will appreciate the sound of someone yelling across the street that the Packers stink when I wear a Green Bay shirt, I look forward to this semester of exploring other sounds of the city and the experiences that come alongside.